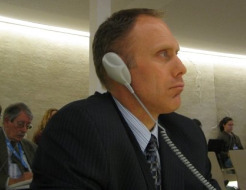 Geneva,Switzerland, March 26, 2009...Religious liberty proponents worry a new United Nations resolution that broadly seeks to protect religious ideologies may do so at the expense of individual freedoms of expression. The non-binding measure, passed by the United Nations Human Rights Council yesterday, is the latest in a series against hate speech and "defamation of religion" that began in 1999 when Pakistan first called for such a resolution. Pakistan remains the leading sponsor of "defamation of religion" resolutions, International Religious Liberty Association (IRLA) officials said. Yesterday's resolution passed by a vote of 23 yes's, 11 no's and 13 abstentions, a less enthusiastic endorsement compared to previous years that suggests growing opposition against such measures, IRLA officials said. Several non-governmental agencies, including the IRLA, The Becket Fund and UN Watch, continue to raise awareness of the potential fallout the resolution could have. "In international law, if a custom is followed long enough it can become a norm," said Barry Bussey, IRLA board member and executive director of the North American Religious Liberty Association. . "Such norms then become codified and become law." With their decade-long history, resolutions against "defamation of religions" seemed well on their way to legal entrenchment, Bussey said. "We are concerned that [the resolution] will limit freedom of expression," IRLA secretary-general John Graz said from Geneva after the vote. Most troubling is the resolution's vagueness, said Bussey. Last year, IRLA experts met to discuss the emerging issue of hate speech and "defamation of religions." With no universally acceptable definition of "defamation of religions," the group concluded that any attempt to enforce the then proposed resolution would be arbitrary and subjective, depending largely on sensitivities of the hearers. "Who determines when a religion is defamed?" Bussey said after the vote. "[This resolution] is simply too fraught with possibilities of abuse of power," he added, urging more concerted opposition when the resolution comes up for renewal next year.